As two of the busiest departments in any business, Sales teams and Finance teams often find it difficult to work with each other–not because they don’t want to, but because a lot of factors get in the way. 1. Re-keying of information or repeat entries in Zoho CRM. 2. Inconsistency of information, such as product details or potentials, across systems. 3. Invoicing errors because of miscommunication between teams. 4. Lack of efficiency in sharing sales and finance data across multiple non-integrated tools. Now, all the relevant finance information will be available in Zoho CRM for sales teams to use when negotiating and closing deals, and all the nitty-gritty numbers they handle are automatically pushed to the finance tools so that finance teams can manage their accounting tasks in real time. A common database for sales and finance. Previously, when sales and finance teams worked with separate databases, their lack of access to the same information at the same time slowed down the workflow, from the sales pipeline to accounting processes. If salespeople generated quotes, purchase orders, or sales orders in Zoho CRM, finance team members had to manually import that data into their separate accounting software. 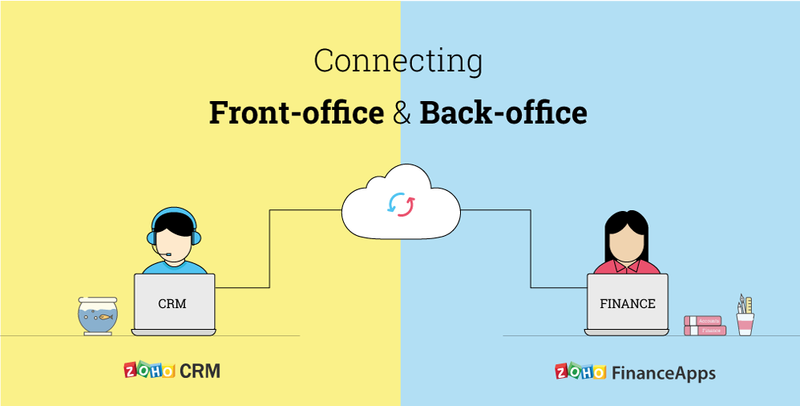 With the new integration, these teams now share a common database and can instantly sync data between Zoho Books and Zoho CRM. Any quotes or invoices created in Zoho CRM are automatically entered as data in Zoho Books, so neither of your teams has to waste time with double-entry data errors. Submit expense reports from Zoho CRM. 1. Record expenses inside Zoho CRM. 2. Create and submit expense reports from Zoho CRM. 3. Analyze the expenditure for each lead. By linking your expense report to a customer (or account), you can ascertain the precise costs involved in acquiring the lead. You’re also able to see how much each of your sales team members is spending, with extensive analytics on expenses for each user. Maintain subscriptions and retain customers. For a subscriptions-based company, one of the most difficult and time-consuming tasks is having to manually track payment schedules for different customers and knowing when subscription cycles are coming to an end. If a customer’s subscription is not going to be renewed automatically, then the service you provide for them could be automatically cut off, and that’s bad business. With this integration, your sales team can manage the subscription information of all the customers they have brought in, see the dates on which the invoices were generated, and keep track of expiration dates, all in one place. We’ll definitely be enhancing the integration in the future. You can now enable it and break the barriers between sales and finance. Present To Your Team From Miles Away With Zoho Show. No Replies on Count on it: The all new integration between Zoho Finance and Zoho CRM. Commenting is Disabled on Count on it: The all new integration between Zoho Finance and Zoho CRM.